I must say there have been a few changes to the artists linoleum used to make linocuts/linoprints over the last 30 years or so. 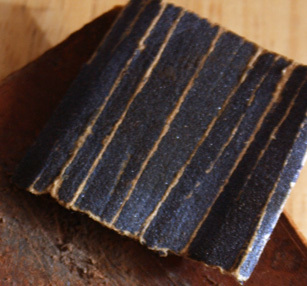 Many people will remember those old hard brown squares of lino we valiantly tried to carve in our high school art classes! Well they have progressed since then…thank goodness!! 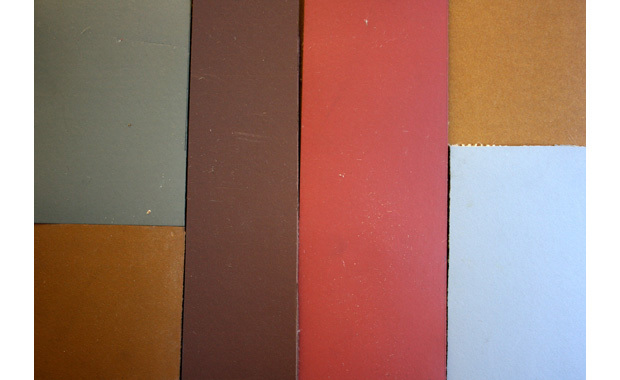 Below are some of the samples of the lino that I have used over the past 20 years – much of which is from the past 10 years. Just a few small thoughts of my experiences with these different types of artists lino. This is the original hard lino from a very long time ago…. Many of my earlier linoprints use this lino. 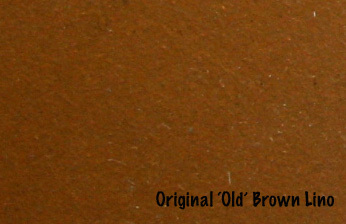 This is the light brown lino silkcut replaced the lovely grey with, assuring me it was exactly the same just a different colour – I did not find this to be the case. I found it difficult to carve. 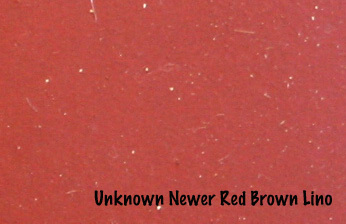 So sourced some other linoleum listed below…. This is a very flexible easy to carve lino. It has a smooth surface for printing and does not need to be heated for carving. However I found for fine detail work it does have a tendency to chip off a little. 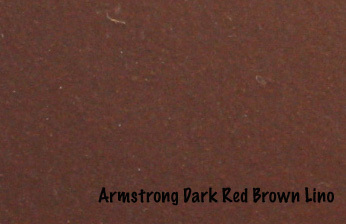 This is Armstrong dark brown lino. I have found it carves nicely/easily but again can ‘chip’ off smaller fine details more easily than other lino but a little less than the light red brown lino above. 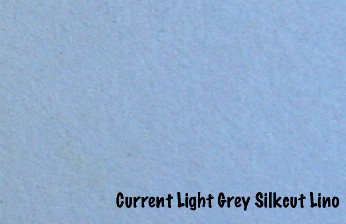 This is the current light grey silkcut lino. It is a little firmer to carve than the above brown lino but it does chip less so can be better for finer detail. 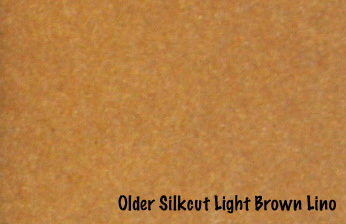 I must say I do like this new style the silkcut have produced. These are the 4 main sizes of blades I use to carve my linoblocks – they are known as ‘V’ gauges and are blades designed to push away from you whilst you carve. 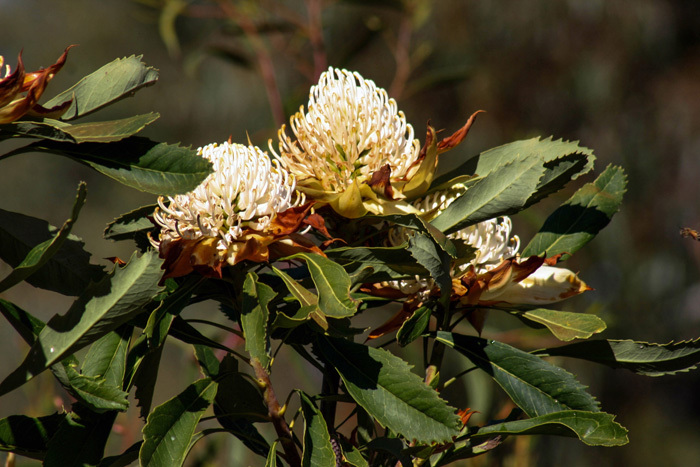 There are other blades known as ‘pull’ blades designed to pull towards you as you carve – I have never used these. The blades above fit into a handle when using them to carve lino. Now at this point I need to stress that these particular carving tools are over 25 years old – they are certainly old and faithful and I guard them jealously. Not because they were hugely expensive but because out of long years of use they are comfortable. Sometimes it’s hard to let go of the comfortable. I have noted that a newer set of Speedball blades and handles are not the same as these – they are a different shape of handle and gauges and have less weight in the handle. I have not the access to shops that sell the more expensive carving tools nor the finances at this point and I would need to feel them before I bought them but I also know that into the future I will need towards replacing these. The end section on the right side of the above image below comes off and the spare blades can bet stored there but this is not something I do. I do also though use some padding I tape onto the end for the finer blade due to the constant pressure into the palm of my hand whilst carving. The end of the handle fits neatly and comfortably into the centre of my hand. Essentially you need to find the blades and handles that best feel comfortable to you. As an aside I do not like the long straight wooden handled cheaper lino carving tools that are most used in schools. They contain only larger sized blades and foe me I find them cumbersome to use as I have a small hand and do a lot of fine carving. Essentially the lino blades that you use regardless of brand etc are a metal blade or knife designed as gouges. Continual use of the carving linoblocks will make them blunt and like any knife they need to be maintained and sharpened. this can be a delicate process and has taken me a good while to develop the skill of honing the blade to achieve a good cutting edge for my blades. On the end of each lino blade is a beveled edge that I feel needs to be maintained and kept sharp. 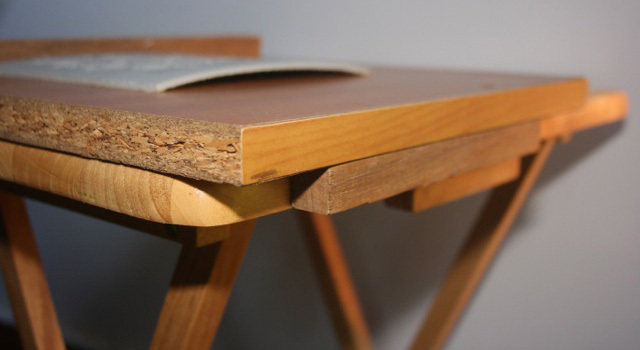 You must be careful to not damage this edge nor significantly change the bevel/angle as you sharpen it. Like I said it can be a tricky process. Fortunately for me my Dad is really good at such things and has helped me out. So it may be helpful to find someone experienced with sharpening blades to help you at first until you can manage to work it out for yourself. 1. 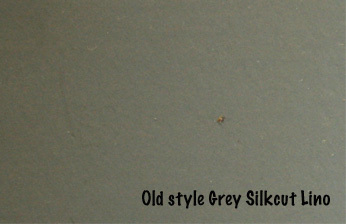 Being careful to maintain the angle or bevel of the blade I work the blade gently across (usually in a figure 8) a super fine sharpening stone and a good quality machine oil – I use this sparingly. 2. I then follow this up by using by a very fine sandpaper for inside and outside the V gouges – that I use occasionally whilst carving to sharpen particularly the inside of the V gouge. 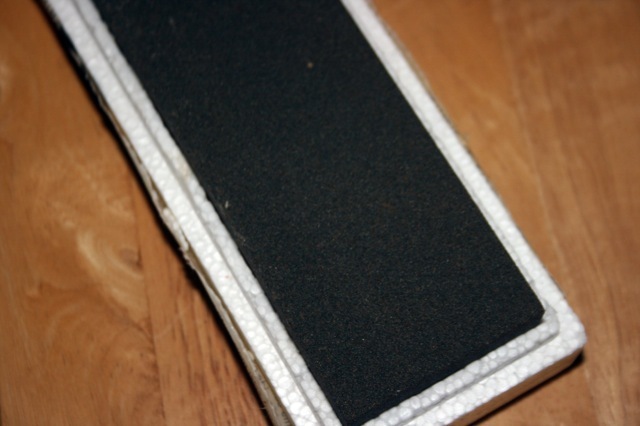 You can see the lines on this piece of sandpaper from folding it to work inside the V gouge. 3. 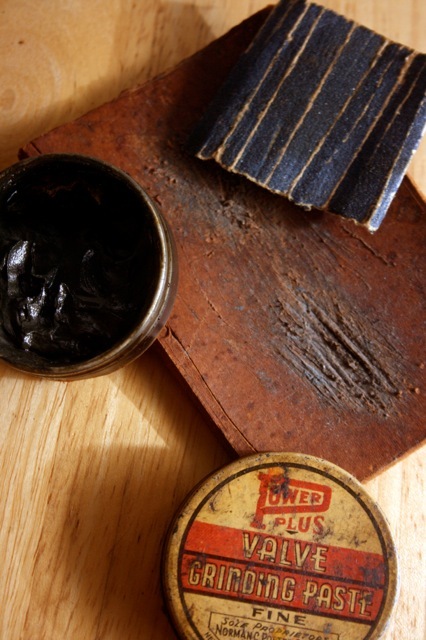 Finally I use of a strong, thick piece of leather (you can attach it to a block of wood if this is easier for you) and either with or without a super fine grinding paste – I use this fairly often whilst carving to maintain a nice sharp edge for neat lines. Always work the blade by pulling it towards you at the correct angle for the bevel – it can take a while to ge the hang of it but as they say ‘practice makes perfect’ – well anyway it will get easier. I find that as I carve and the blade becomes less sharp it is both harder to carve and more difficult to cut fine lines or edges – so if you are finding that once the carving seemed easier and is no longer that this is the time to look at sharpening your blades. For me the No 1 blade is the main blade I need to keep sharp as I am carving. If you keep your blades well maintained and sharp you will find carving easier, neater and for me more rewarding. WARNING!! 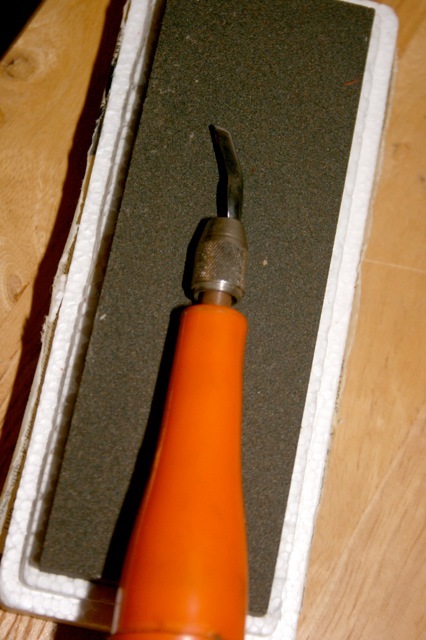 Lino cutting tools are called ‘gouges’ for a reason! Their purpose is to gouge or carve the surface of the lino to create the design and as such they are sharp and can easily cause unwary users to end up with gouges fingers and hands. I believe lino carving should come with a clear warning label and a large packet of bandaids!! Believe me if you are unwary and the gouge blade cuts you it hurts – I have done it many times and have a fair respect for these blades. The secret to easier and cleaner carving is to keep your blades sharp and that means that you should take some basic precautions especially when you are first beginning carving. The above shows an example of a simply and easily made carving board. 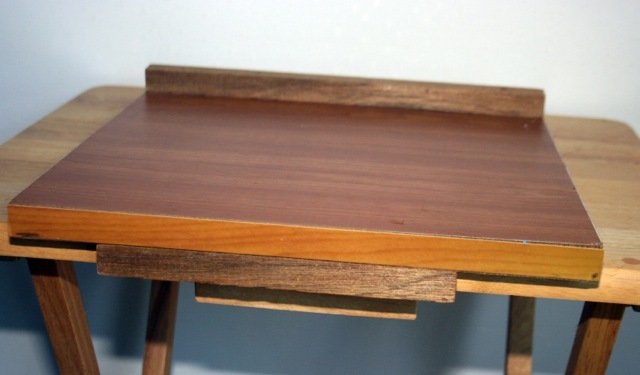 It is essentially a flat piece of board with 2 small square dowel ends – one on top to push the lino up against and the one below to stop the board slipping forward across the table as you push through the lino whilst carving. 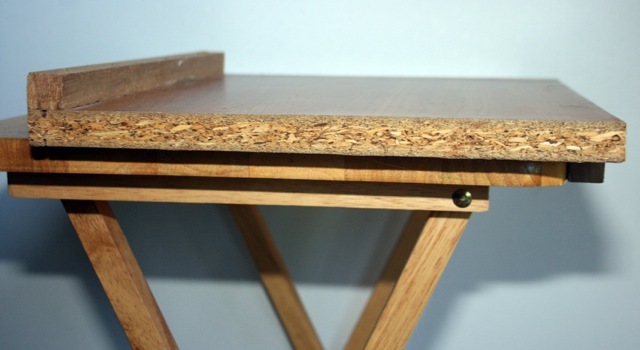 When it is placed on a flat on a table and used correctly it provides a solid and effective safety measure helping to guard against carving fingers. Essentially the most common way to cut yourself is to place the hand that should be holding the lino with, behind the carving hand – essentially in front of the blade! Despite what you may think this is easy to do as when you are concentrating on carving and pushing the blade forward it seems natural to stop the lino being pushed forward as well by holding it with you hand. If you do this YOU WILL cut yourself! 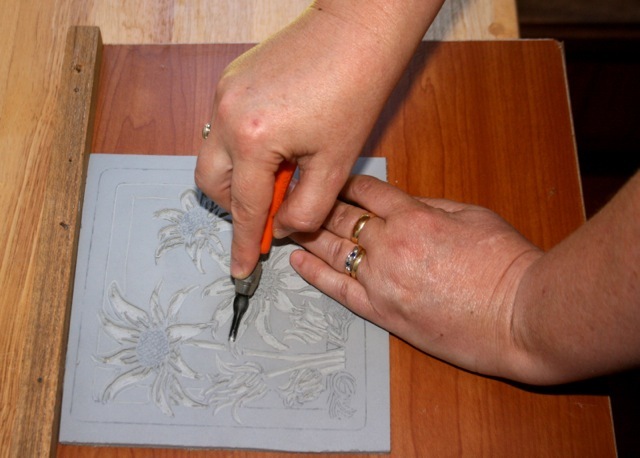 It is very easy to slip whilst carving through the lino and the carving blade to shoot forward in to the air. So it takes a bit of discipline but try to remember to place the lino up against the from ‘stopping board’ on your carving board and this will stop the lino and bear the brunt of any carving slips. Better to hit the timber than your hand! For those times when you do slip and do end up cutting yourself. 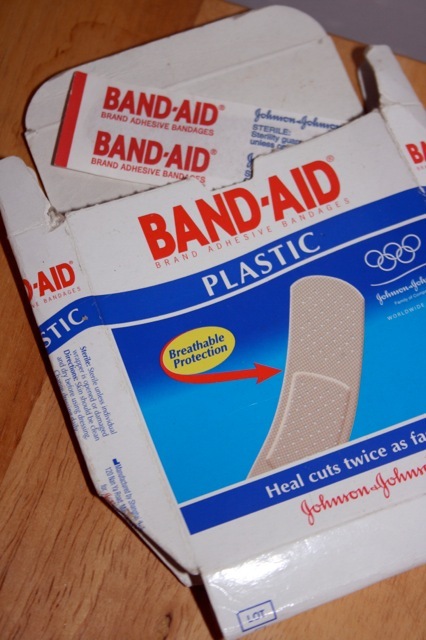 try to use the band-aid straight away to prevent the bleeding to stop as soon as possible. Warning!! Remember to always carve your design in reverse!! 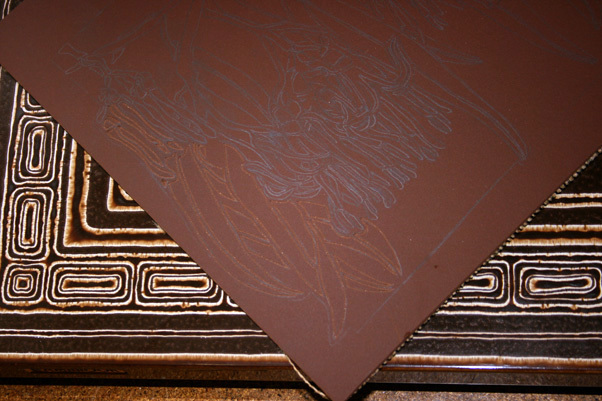 On the left is a section of the linoblock carving of a Tawny Frogmouth linocut design – ‘Sleepy Tawny’. 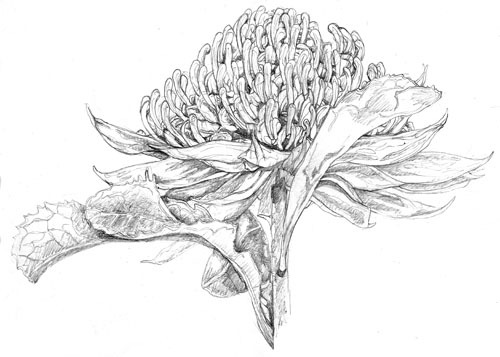 It is the same size and companion image for ‘Tawny Stare’. 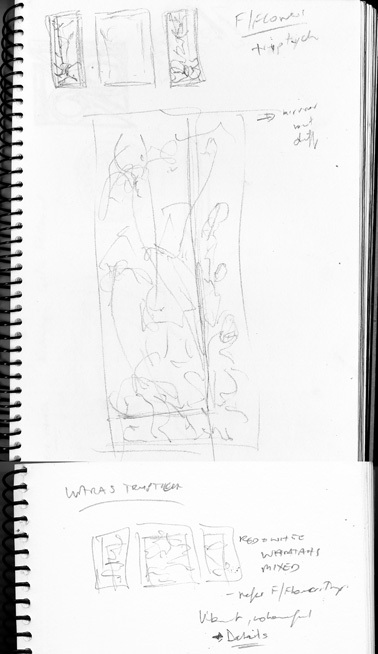 The image on the right is the design template I develop before carving and use as a reference whilst carving. They are a mirror image. The important thing is to remember that if you want the final linocut to be the same as the original printed design you must carve it in reverse!! This is particularly important if you are including lettering in your design otherwise you may need to be like Leonardo da Vinci and be able to read ‘mirror writing’. 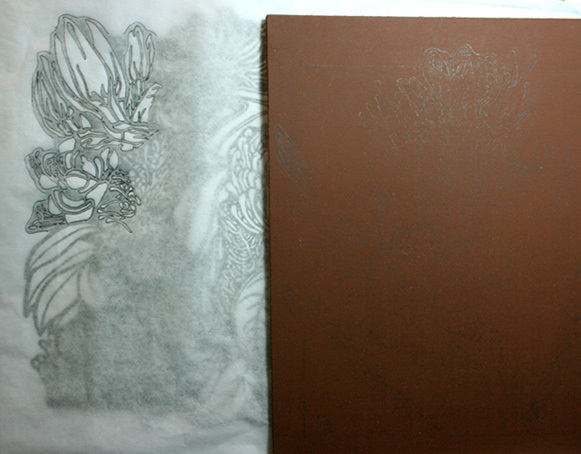 The image on the right shows how I transfer my designs I have worked out on paper onto the linoblock. After I have finished developing the design and inked it in as a black and white design I then used the old-time honoured tradition of…tracing the design onto greaseproof paper (non waxed) with a 2B/3B pencil, attached it face down on to lino on the back with masking tape over the wrapped edges, rubbing hard with a HB pencil over the penciled design, removing the paper and TA-DA!! Magic!! Others use carbon paper etc but you need to remember to reverse the design…my method automatically transfers it in reverse by simply turning the paper over to transfer the graphite onto the block. 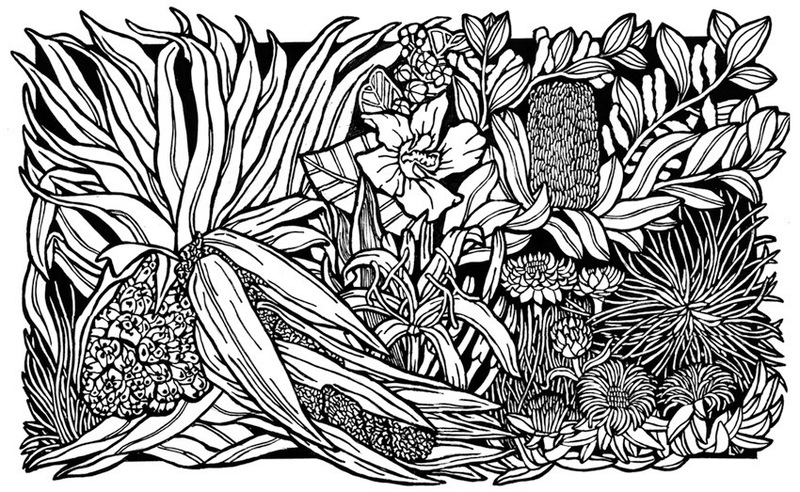 Other linocut artists draw directly onto the block without making a paper design, there can be an immediacy to this style but given my pedantic nature with my wildflowers, wildlife and artwork I like to have it all worked out beforehand. I have two – both of which belonged to my mother-in-law – she LOVED having large numbers of family and friends over with tables full of food. I actually don’t think these food warmers were used much as they seem brand new. I can also remember the warmers that had candles underneath. You can tell they are from the 1970′s by the ‘mission brown’ colour scheme and patternwork – the other one is that delightful 1970′s ‘orange tones’. They are however great because I set them up next to me and lightly warm the lino which makes it easier to carve. 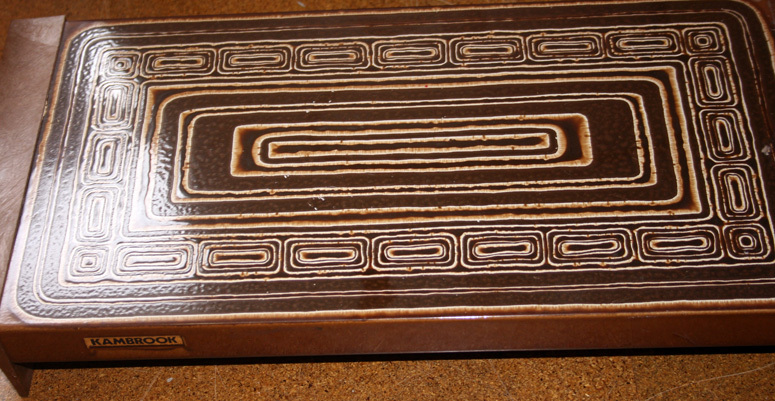 So for all you ‘lino-carvers’ out there – the next time you visit a garage sale or op shop check to see if they have one – they work exceptionally well.